For people with conditions that affect the heart and circulation, or who have had a cardiac event such as a heart attack, it’s hard to overstate the importance of exercise-based cardiovascular rehabilitation. Cardiac rehab significantly lowers the risk of dying from cardiovascular causes as well as all-cause mortality, improves quality of life and exercise capacity, and reduces overall cardiovascular risks. Even though more women than men are eligible for cardiac rehab programs, less than one-quarter of cardiac rehabilitation participants are women. The Women’s Cardiovascular Health Initiative (WCHI) at Women’s College Hospital is working to narrow that health gap. Even when women are referred, they are less likely than men to attend their initial appointment. 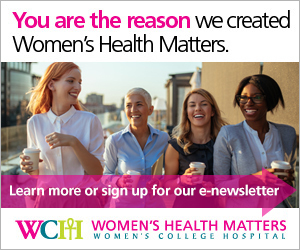 The WCHI program, which was designed specifically and exclusively for women, has very high uptake compared to traditional programs, with 76 per cent of women referred attending their first appointment. To understand why some women don’t attend their initial assessment, Price and her research colleagues at WCHI designed a study that looked at women who were referred to cardiac rehab but did not have an intake assessment. There were 169 of these referrals from 2008 through 2010, and 53 of the women agreed to participate in the study. “We thought if we can better understand why a patient didn’t come to that specific appointment, we would have a better chance of helping others,” Price says. When they compared the 53 non-attenders with women who did attend their intake appointment to cardiac rehab, the researchers found that those who did not attend had to travel significantly farther to get to rehab. Financial issues may not seem like a barrier to care in Canada, but it’s one that came up frequently in the study, usually in relation to transportation. Other big issues were family and work responsibilities, fatigue and anxiety. “Women talk about this all the time. They have multiple roles and multiple responsibilities, and carving out time for themselves to go somewhere can be very difficult and very challenging for them,” Price says. Some women hadn’t been made aware of the importance of cardiac rehab. For others, timing was a problem: either they were unable to attend at the time of their referral, or they needed time to cope with the impact of their diagnosis and treatment. WCHI staff actively seek ways to overcome barriers to care, and are using the information from the study to get more women to cardiac rehab. Another benefit from the study is that many of the women who did not do rehab expressed renewed interest in it. “Fifteen of them actually went on to attend cardiac rehab closer to home, and 35 per cent asked us to send them more information about cardiac rehab. So even a couple of years later, there was still interest,” Price says. Cardiac rehab is recommended for women who have had a heart attack, coronary artery disease, a bypass or stent, heart failure, and other conditions affecting heart health. Women with diabetes can also be referred to the WCHI cardiac rehab program.